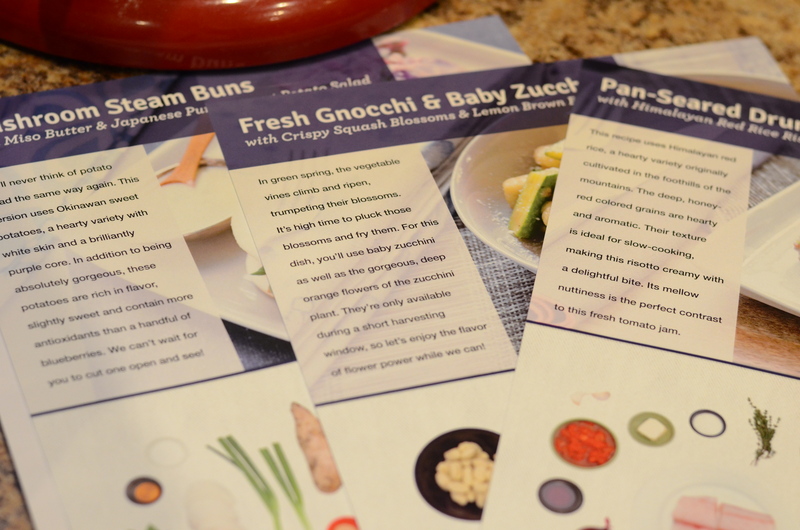 This post is the third in a series in which I review one of the services that provides pre-portioned ingredients and recipes, delivered to your door. The first was Hello Fresh, then Plated, and now Blue Apron. See: Salmon Salad – Plated and Hello fresh – hello leftovers? 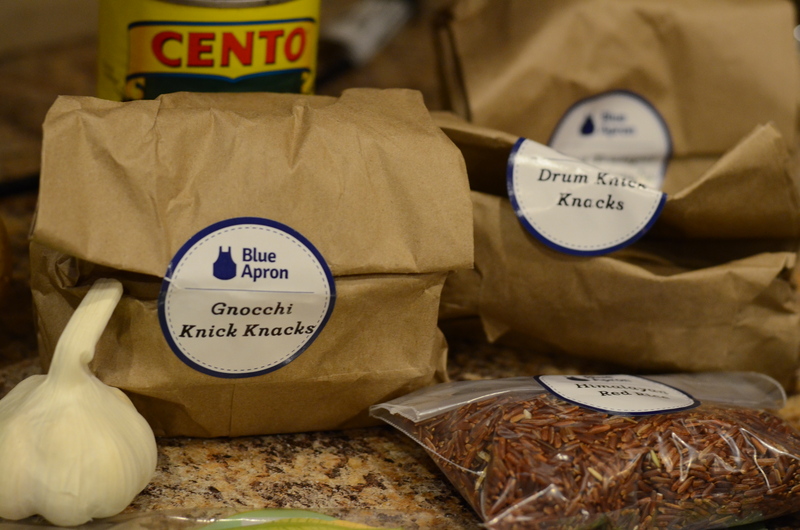 Like I did for the others, I signed up for Blue Apron through a promotion. It may have had to do with the process of entering that code, but I was a little put off by the fact I had to fully commit my credit card and ordering information before I could select the meals that were going to be covered. I saw the recipes they were featuring in the upcoming weeks. I discovered that while I wasn’t permitted to mark off individual recipes for my next delivery, I could fiddle with my meal preferences (whether I ate meat, fish, etc.) in order to get what I wanted. From some of the reviews, I see that people don’t always receive their top picks. I was pretty excited about the three meals kits I would be getting: Pan-Seared Drum and Tomato Jam with Himalayan Red Rice Risotto & Asparagus, Fresh Gnocchi and Baby Zucchini with Crispy Squash Blossoms & Lemon Brown Butter, and King Trumpet Mushroom Steam Buns with Miso Butter & Japanese Sweet Potato Salad. I felt good about the recipes because several of them used ingredients I never have or had never even tried. Like Hello Fresh, I had to order three meals of two servings (I could, mercifully, order only two with Plated). The pricing is very similar, at $10-$12 per person per plate. 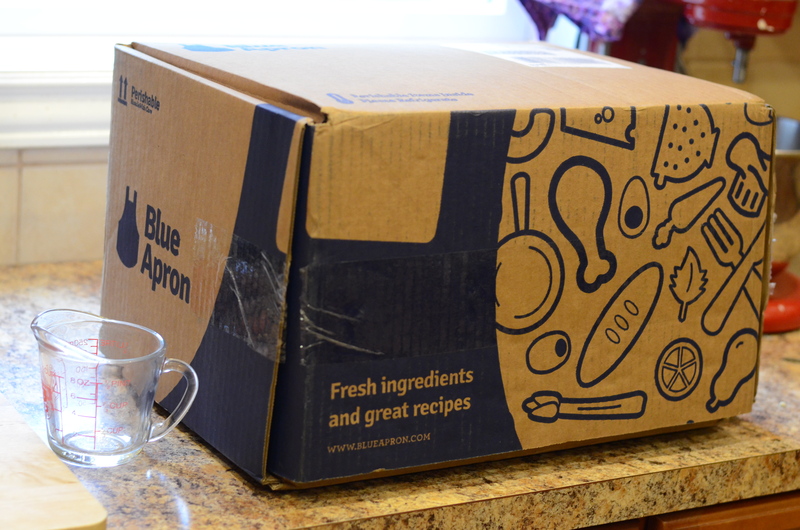 Blue Apron’s delivery came in a giant box. It was thoroughly lined with padding, which kept the ingredients well-protected. Everything arrived in great condition. Blue Apron uses the same brand of freezer packs as Plated to keep highly perishable items, like fish, cool at the bottom of the box. I liked the use of brown bags for packaging some of the smaller, miscellaneous ingredients. There was a mix of items that did and did not need refrigeration, but they were small enough to stick in the fridge either way. As usual, I executed the fish recipe first. I enjoyed the fish itself, and appreciated the accompanying ingredients, but the dish as a whole seemed overly simple. I had the same issue as before with the rice being bland at first, until I realized that I needed to be truly liberal with salt and pepper. Perhaps I should have added extra garlic–the recipe called for two cloves and they gave me a whole head, which happen to be pretty old. The recipe I am featuring here is the gnocchi and baby zucchini recipe; this one came out great! I will say that on the day I unpacked the box, I looked over the squash blossoms, the very top item. I was shocked to see in blaring text that they were a product of Israel. 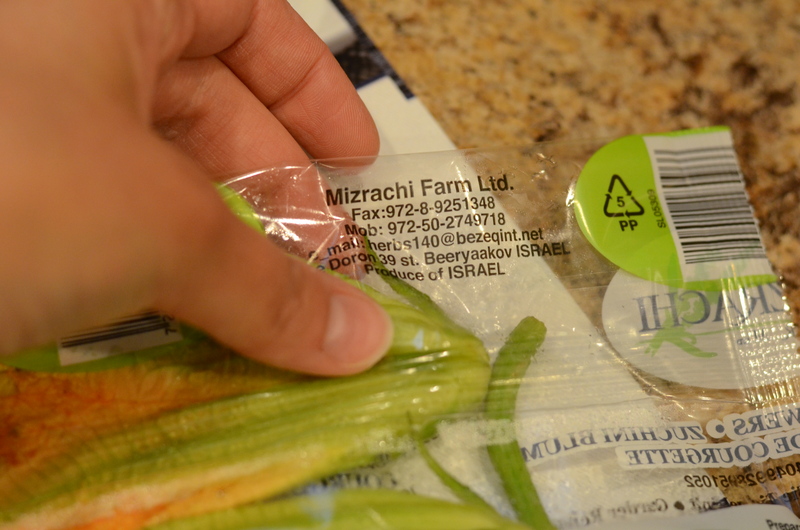 Now, I know my produce can come from various parts of the world a different times of the year. 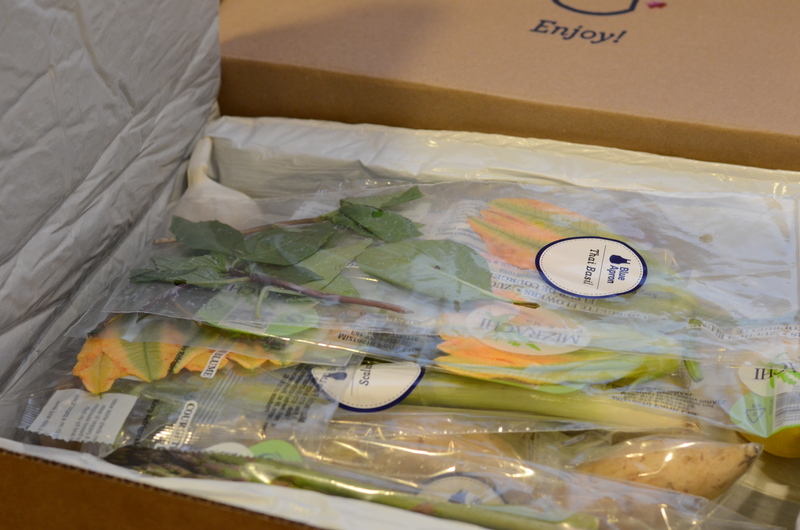 But I felt that Blue Apron had specifically alluded to the fact it is spring in the United States, and it is the season to pick the blossoms from the zucchini plants here. Nevermind that it is a little early for that. I felt slightly misled. Start by washing and drying the produce. Set a large pot of salted water over heat to bring to a boil for the gnocchi for later. 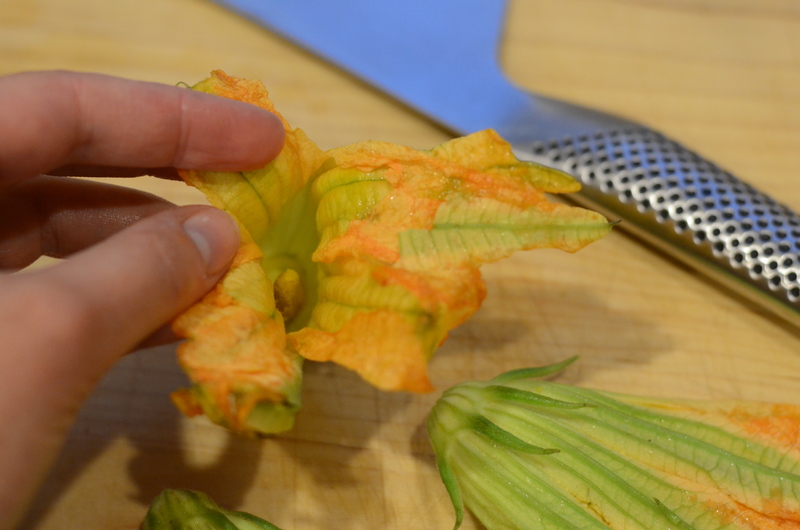 Remove the stems and pluck the stamens out of the squash blossoms. Reserve two of the whole flowers to fry. Roughly chop the other two flowers. 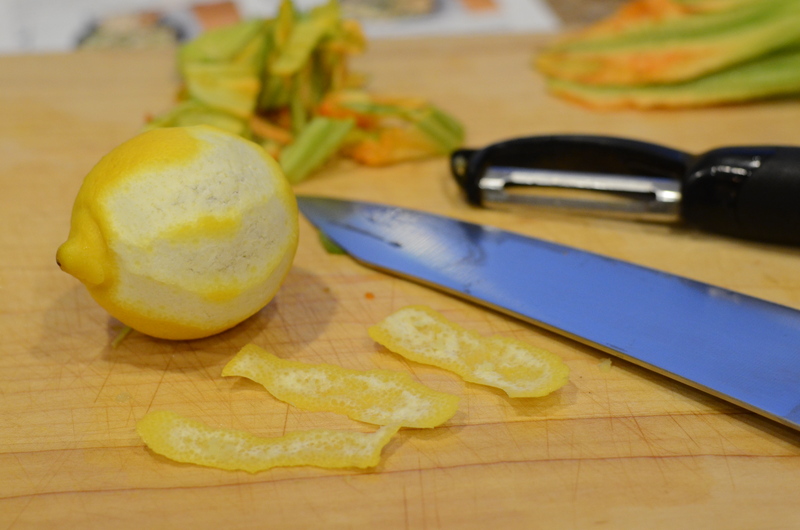 Take the lemon and remove some of the yellow rind with a peeler. Avoid the white bitter pith. Finely mince the rind and measure 2 teaspoons to set aside. Cut the lemon in half. Take one of the halves and half that, so that you have a wedge for serving with each of the plates. 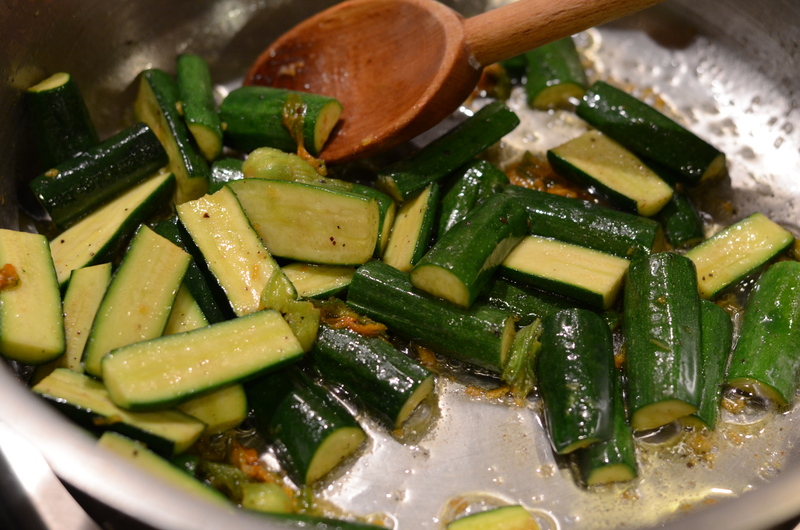 Cut the tops and bottoms off of the zucchini and discard. 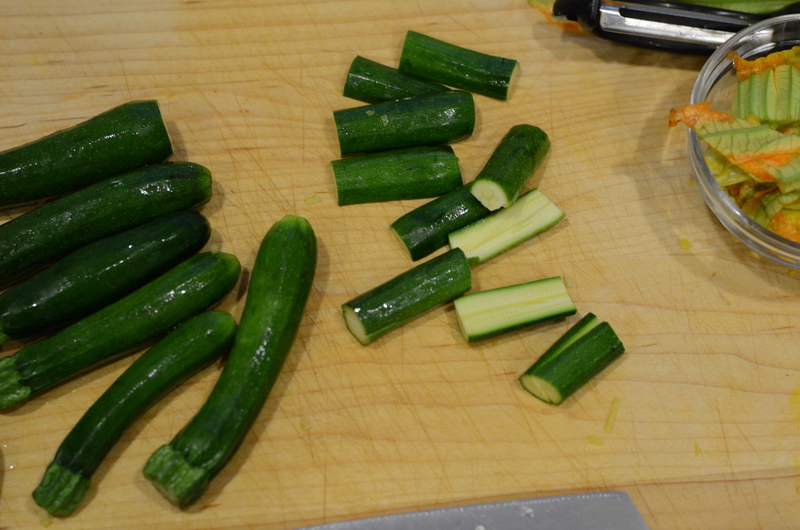 Slice the zucchini in half lengthwise and then crosswise so you have quarters. Set aside. Now we fry the flowers. Combine the rice flour and ⅓ cup of water in a medium bowl to create a batter. It may seem very thin. Coat the bottom of a medium sauté pan with oil and heat until very hot. If you flick a little water into the oil and it sizzles, it is ready to go. 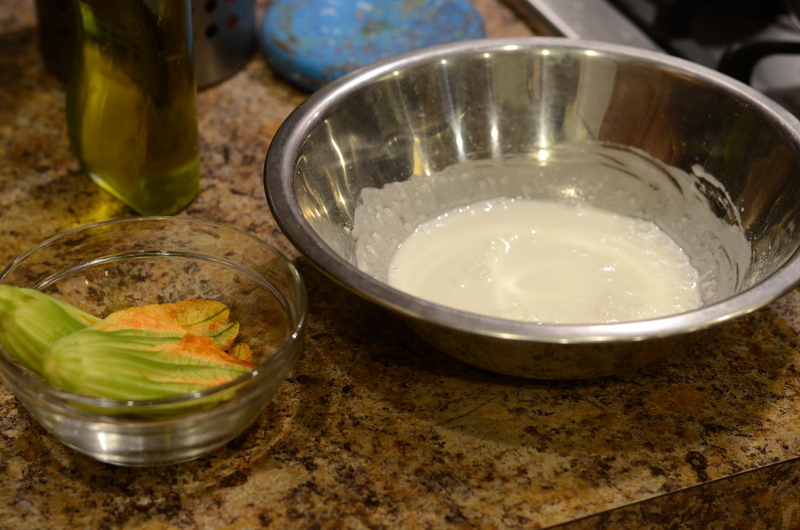 Dip the whole squash blossoms in the batter, allowing any excess to drip off. Because my batter was so watery, I felt like hardly anything stuck. Perhaps I could have added less water. 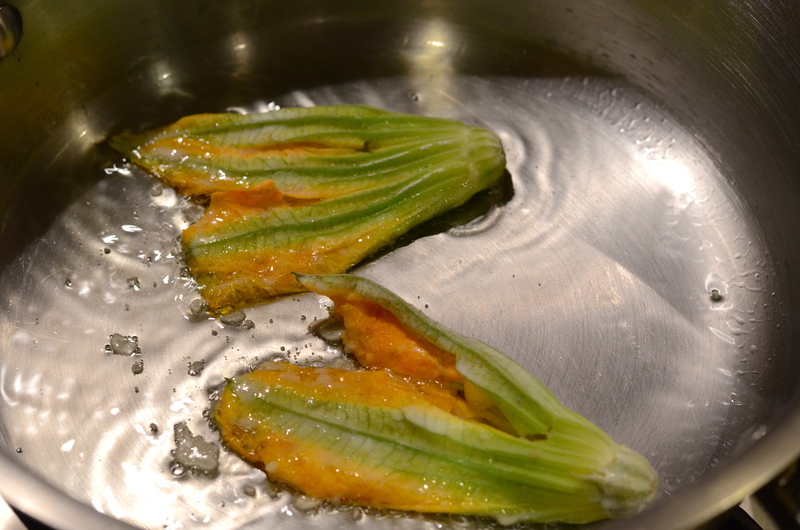 Transfer the battered squash blossoms to the pan and cook until crispy, 2-3 minutes per side. Transfer to a paper towel-lined plate and sprinkle with salt. Set aside. Discard the oil from your sauté pan, pouring it into a heatproof bowl to cool first. Carefully wipe out the pan. Time for the lemon brown butter sauce. 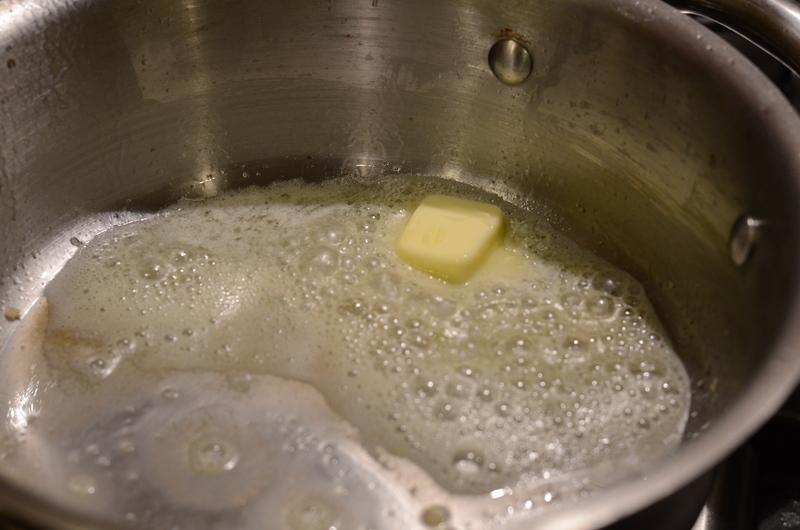 To the same pan, add the butter and melt. As a warning, the pan may have retained so much heat that the butter already starts to melt and brown without turning the heat back on at first. Watching closely, cook until the butter foams, and swirl around until it becomes golden brown and smalls nutty, about 2-3 minutes. 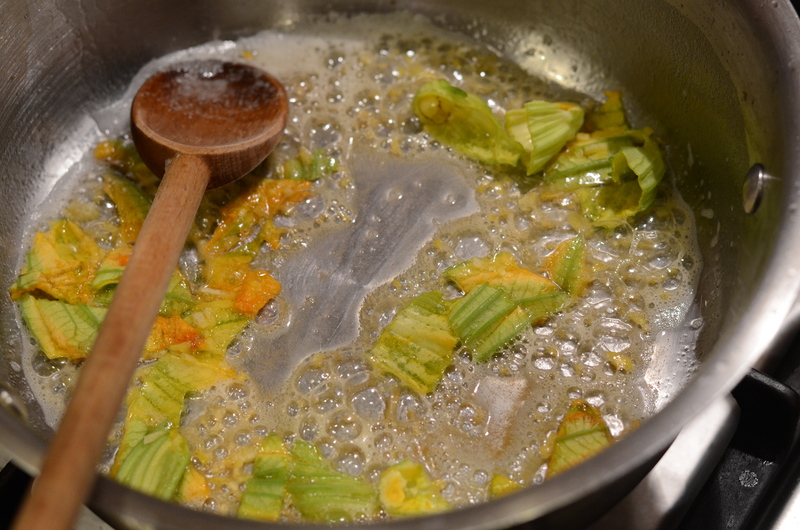 Add the chopped squash blossoms and lemon zest and cook, stirring frequently, 5 to 10 seconds, or until thoroughly coated. Add the zucchini and season with salt and pepper. Cook, stirring occasionally, 3-5 minutes. Once the squash is tender, stir in the juice of your lemon half. In the meantime, add the gnocchi to the pot of boiling water. 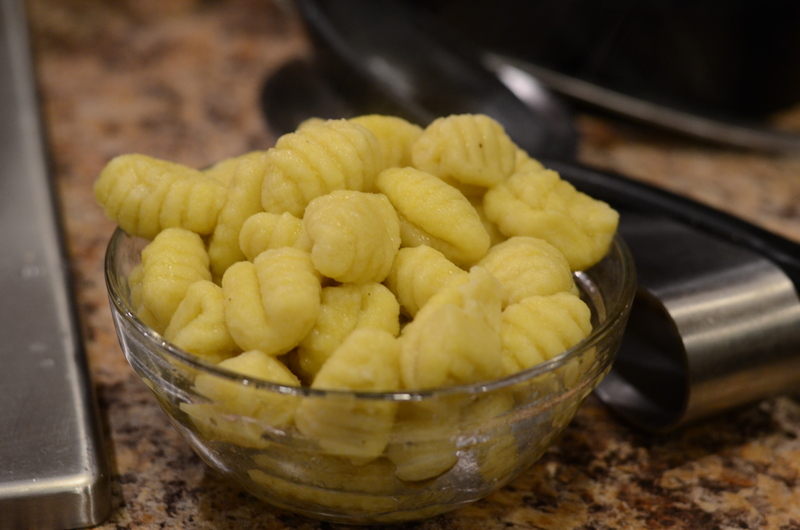 The gnocchi should be done and tender in 2-3 minutes, when it floats to the top of the pot. Use a slotted spoon or strainer to transfer the cooked gnocchi to the pan with the cooked zucchini and brown butter. 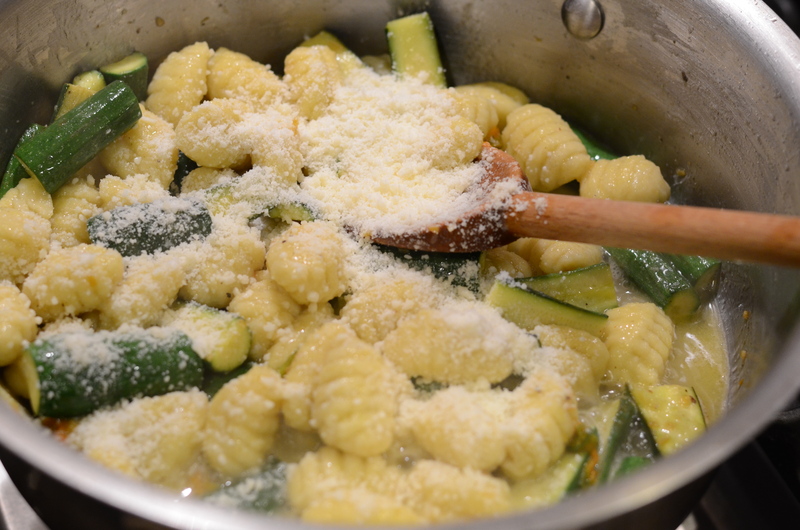 If the zucchini isn’t tender yet, transfer the gnocchi temporarily to a separate bowl. I love the little ridges! 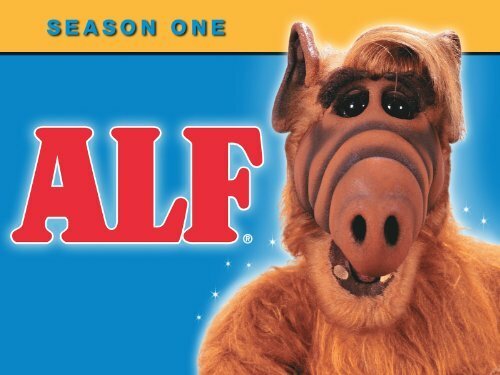 These reminded me of Alf. Pour in most of the Pecorino cheese, keeping a few pinches for serving. Scoop ¼ Cup of reserved pasta water and stir into the mixture. Remove from heat and season with salt and pepper to taste. 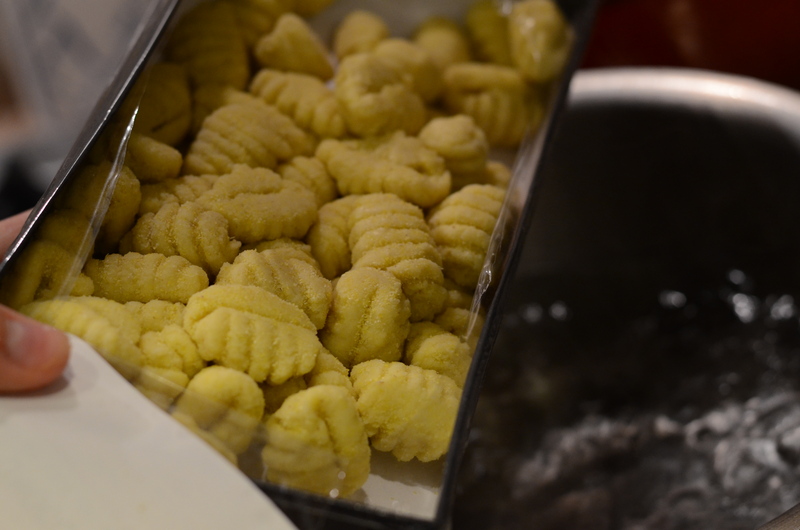 Serve the gnocchi on 2 dishes, topped with a fried squash blossom each. Sprinkle with the remaining Pecorino cheese. Once I scooped out what I felt was two servings, there was about one serving left in the pan. I was underserving because my husband and I had snacked beforehand, and were eating a salad as well. For once, I was content with the quantity of food that came out. And the taste was wonderful. The lemon flavor really shined, balanced by the salty cheese, and the tender gnocchi and zucchini created a very pleasant mouthfeel. I would have liked to see the fried blossoms come out crispier; improvements could be made to the batter. 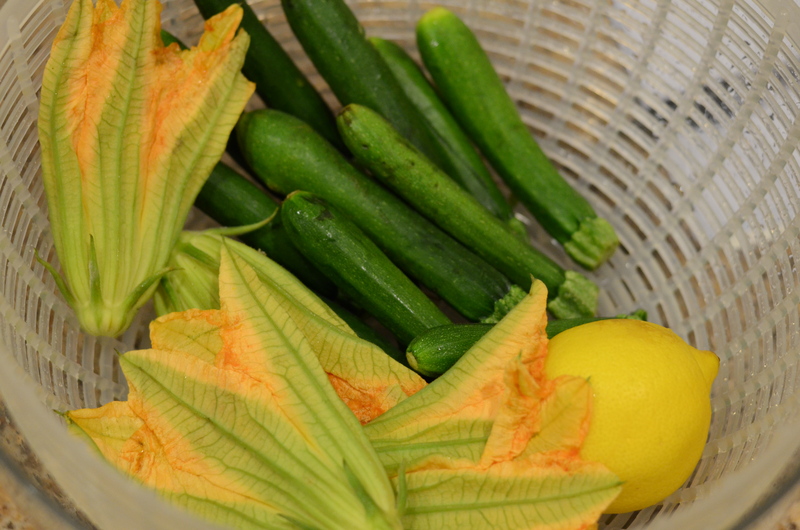 This will be a great recipe to return to when the squash blossoms are harvested here in New York! 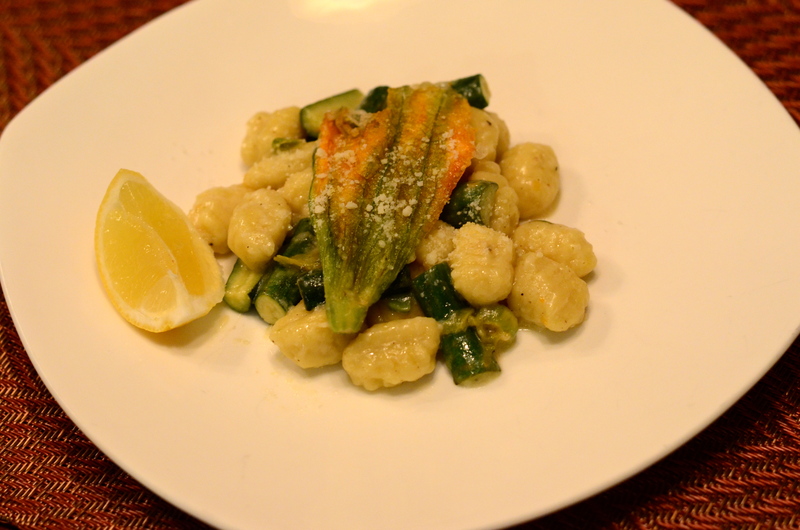 This entry was posted in Fast and easy, Pasta, Recipes, Vegetables, Vegetarian and tagged baby zucchini, gnocchi, lemon, pecorino, squash blossoms, zucchini. Bookmark the permalink. What do you do with the shipping box? With all of the padding, it seems very wasteful if it can’t be reused! Is it recycleable? The gnocchi sound amazing though. That is a good question–I didn’t mention it in my post, but I think it would make sense for these companies to develop a system to take back the shipping materials, because they could totally reuse them! The padding was removable, so the box itself can be recycled curbside with the corrugated cardboard. It would be a great box for future shipping/moving, so I would have kept it if I didn’t already have plenty of boxes saved. I plan to save the foam padding for that purpose, since I have the space.